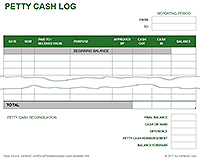 The Vertex42™ collection of financial spreadsheets includes templates designed specifically for small business owners. We hope that you will find them as useful as we have! The spreadsheets featured below also work with OpenOffice and Google Spreadsheets, so if you are operating your business on a very tight budget, hopefully you'll be able to make these financial templates work for you. Create a business plan using Word with a companion Excel workbook for customizing financial statements. Summarize what your company owns and owes. Compare to previous year(s). Contains two worksheets for creating a yearly business budget - for service providers or companies producing and selling goods. 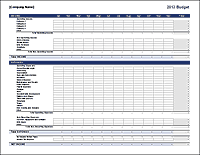 Based on the Income Statement template, with similar categories and layout. Create a 12-month breakdown of your sales and business expenses. Perform a detailed analysis of expenses and cost of goods sold (COGS) for multiple products. Calculate the Break-Even Point or Payback Period for a new venture or product. Based on the Business Budget template - helps you create a 3-year profit and loss projection. Create a sales forecast spreadsheet to use in your business plan, including estimated sales, COGS, and gross profit on a monthly basis over 3 years. Includes sample charts. Estimate the startup costs for your new business. Essential for any business plan. Where does your company get and spend its cash? 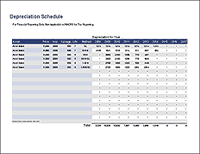 Calculate yearly depreciation for multiple assets using the straight-line or declining balance methods. A billing statement can be used as an invoice as well as an accounts receivable ledger. This works well as a customer account statement. It can also be used to bill a customer. 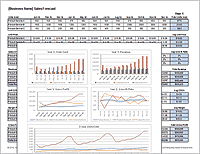 Create a horizontal or vertical waterfall chart using Excel. NPV Calculator - A simple spreadsheet to help calculate Net Present Value and Internal Rate of Return of various investments. 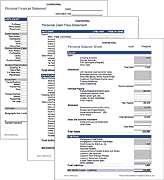 Financial Management Templates at templates.office.com - The new Microsoft Office® templates gallery has a few financial statements. Free Financial Statements - Balance Sheets, Cash Flow, Income Statements, etc.